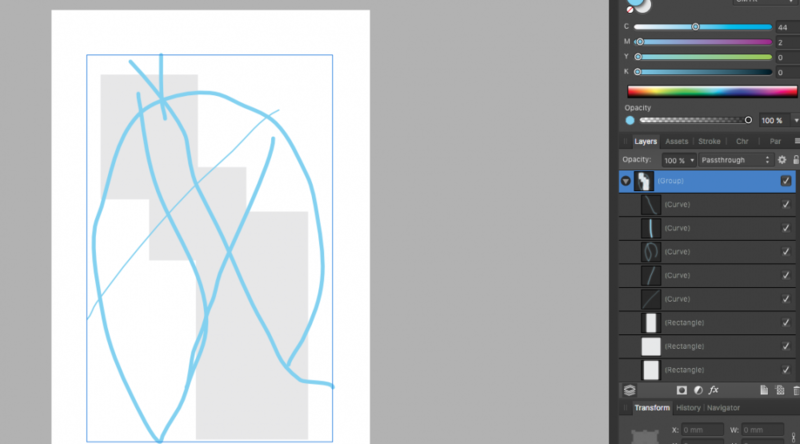 I am wondering if its a bug or I am misguided in any way, but the way of masking, when I grab one layer and hold it and let it go when the short vertical blue line appears on the layer I am about to put it on, then it all changes into a whole blank document. As well as when I select an object and I press the draw inside icon, it doesnt take effect whe I start using the brush tool on it, although in the layers menu the brushed lines appear inside the object. Does it have anything to do with the grouped objects I am about to draw inside or.....? Am I missing anything? What type of layers/objects do you have inside the groups? Groups can contain several types of layers some are not adequate to use as masks (adjustments, fill layers etc). There's probably something there that's messing it. I just figured it out. I have to place them on the artboard one above the other, then it is visible. Dumb mistake, sorry. The draw inside thing still stands, just cant upload the image for some reason. So I group for example 3 rectangles, then I select them, press the draw inside icon, then I switch to the brush tool and start coloring, but the lines doesnt stay within the grouped rectangles, although in the layers menu they appear inside the correct layer. If you want to draw inside the three rectangles you must add them (geometric/boolean operation) so they become a single object (select the three rectangles then go to menu Layer ▸ Geometry ▸ Add). Then make sure the resulting shape sure is selected, and press the Insert inside the selection button and it should draw inside the "three" rectangles (which are now a single object). If you simply group them then the line is drawn inside the group as a separate element instead. Thank you very much! It is clear now and working!